Welcome to the Shostakovich Region of the 2016 HornRank Marching Brackets! You can read about how we seeded shows or vote in the Copland Region, the Reich Region, and the Barber Region. The third round closes on Wednesday, March 30, 2016, at 11:59 P.M. Round Rock’s first appearance at Grand Nationals was in 2013, and they left Indianapolis with a 4th place finish, a music caption victory in Semifinals, a Rose Bowl bid, and a thoroughly enjoyable show. They are now one of the country’s beloved programs, and this show was a large part of their ascent to national recognition. 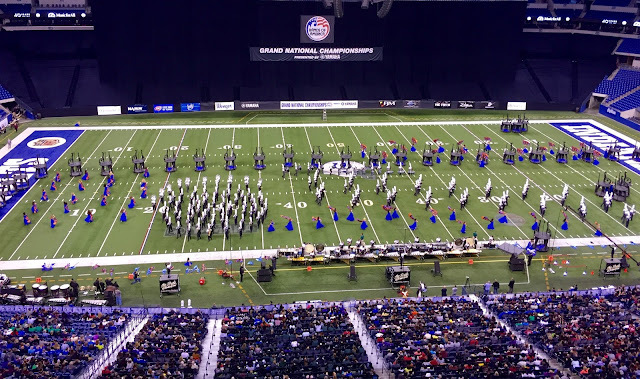 Flower Mound asserted their place as a national powerhouse program in 2015, winning San Antonio and jumping from 44th in individual music at San Antonio in 2013 to winning the music caption (in prelims) just two years later. We’re excited about this group’s future; “Surreal” may be just the beginning of consistent world class performances for Flower Mound. Make sure to also vote in the third round of the Copland Region, the Reich Region, and the Barber Region. It's not all about elaborate props. After all, it is 'Marching Competition'. Musicianship and marching technique is what it's all about. The props are just that, props. Should never, EVER, be what makes a band great or not. And hands down, The Round Rock Dragon Bands' marching technique, musicianship and talent will out perform all the prop heavy bands. While I acknowledge and respect your opinion, I kindly disagree. Round Rock is a phenomenal band, but so is Flower Mound. Yes, Surreal was a prop-heavy show, but that does not give you the right to discredit Flower Mound's success. They consistently won the General Effect caption this season, but General Effect deals with both visual AND musical performance. More than once, Flower Mound won the BOA music caption, as well as a BOA visual caption. The students and staff at Flower Mound clearly work extremely hard to perform their show, as do those at Round Rock. Both of these shows are stunning, and both groups deserve recognition. Please do not put somebody else down to lift yourself up!! Great show and wonderful band kids!!! This is an amazingly close poll between two exceptional programs. Go Rock, Go Band, GO ROCK BAND! I've seen both of these shows and they were both phenomenal!! I'm not surprised the poll is so close! On it! Posted on our booster page! Good luck, RR! <3 to our GR friends in Texas! wow 14,000+ votes in this one. Got your back Blue Springs. Voted for you too. Hey round rock blue Springs needs your help!!!! !